Lasers? What more can be done? “We welcome anything that helps shine a light on this issue, and Anthony Biggs at Jermyn Street Theatre has been a very outspoken champion of the cause. Chasing down audience-members with lasers is a bit like playing ‘Whack-a-Mole’ – by the time it gets to that stage it’s already too late. “We support the tireless and brave work being done by ushers and front-of-house staff to help tackle the growing problem – but there’s far more that Theatres can do before a show starts, as we believe prevention is better than cure. Fire-proofing is preferable to fire-fighting – and signage and announcements and safety-curtain projections and the rest will only get you so far, and at the moment they don’t seem to be doing the trick, do they? “At a minimum, announcements should be made in person, possibly even in character, and not simply over a PA system. And they shouldn’t be the old “reminders” – they need to be a plea, and an explanation, and they need to include a collective routine of us all actually turning our phones off together. Each production can have its own – and it can be something fun that helps get us all in the mood for the show ahead. “This isn’t about exclusion, or etiquette – regular theatre-goers and people of all ages and backgrounds are equally likely to have an incidence of phone intrusion. There’s a range of issues, from photo-taking and filming, to accidental discharge, to perhaps the most problematic of all – the (seemingly innocuous) checking of your phone – which leads to a lit-up “ghost-face”. On an individual basis, perhaps not the worst offence, but in an auditorium of 1000 people with one in every 20 people engaging in it every few minutes it’s a huge distraction – not just to the actors, but far more crucially to fellow audience members. “We need a range of measures (Ushers with torches seeking out the worst repeat offenders is perhaps part of that), and our Mobiles Manifesto on our website www.CumberphoneCampaign.com contains lots of ideas we want theatres to deploy. No one size fits all – what might work at the small Jermyn Street Theatre won’t be the same as at Theatre Royal Drury Lane. “There’s also a great deal more Theatres can do to help educate audiences (and themselves) about how smartphones actually function. Many of us wrongly assume that “Silent” is ok, but that often means “Vibrate”. Similarly, “Airplane” mode may cut your phone off from the outside world, but it doesn’t cut your phone off from you – it can still ping you with calendar reminders and alarms. The “Do Not Disturb” function has default settings that mean repeat calls can get through. Turning the Ringer Volume down still leaves the ones for Alarms and Music untouched. 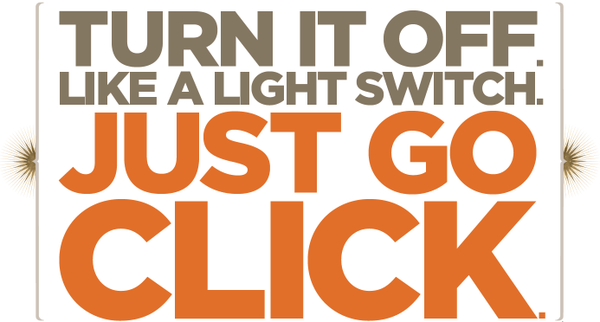 And turning a phone all the way off (which takes an age) leaves it at the mercy of the slightest flick of the on button – not uncommon if your phone is wedged into your pocket or lolling around in a handbag. “We can’t really address the issue properly until we fully understand it. “One of the greatest challenges Theatres face is that a great many of us simply don’t want to turn our phones off. Ever. We’re not used to it. We’re not at all comfortable with the concept. We have them on in our sleep. We’ll diligently switch it to Airplane or Silent (both not nearly enough, as it turns out – see our Stealth Phone page and the “Fly Me To The Moon” initiative for more info), but turning them off is like amputating a limb. And these challenges are only going to increase with the further proliferation and integration of tech into our very personhood. “Besides, smart phones can take an age to turn off (many mistakes can happen with assuming that you’ve turned your phone off, when it’s still buffering its way through a laborious power-down, ready to abort at the slightest provocation), and even longer to turn back on – with a short interval and the immediacy of craving instant reconnection the moment the curtain goes down (or maybe even the possibility of missing a permitted/encouraged curtain-call photo-op at the end of the show), it should come as no surprise that simply requesting audiences to “turn it off” moments before curtain-up isn’t really working as well as it should. “You can even use your phone on the Tube and on airplanes now. The Theatre is one of the few remaining bastions, or rather refuges – and we should aim to more enticingly sell it as such. We should think of it less as a fortress, and more as a spa – regarded not just as a place where you can’t use your phone as you normally would for the other 21 hours of your small-screen-dominated day, but rather a place where we feel we are relieved and grateful not to be able to do so. It should feel less like entering a prison camp, and more like going to your best friend’s wedding – where the concern about your phone intruding upon the event is paramount. MEDIA CONTACT: please email info@cumberphonecampaign.com with your details and we’ll get back to you, or for more immediate response or to arrange an interview, please “follow” us on Twitter @cumberphone and we can exchange DMs (direct messages). You have may read or heard today that I’m keen to employ lasers to deter people from using their mobile phones in theatres – a practice apparently used by some authoritarian friends in China. Whilst I often have murderous thoughts about the selfish bastards who persist in checking messages/answering calls/taking photos/filming etc during shows, I’m not really suggesting we laser them. Aside from the danger to people’s eye sight and a possible outbreak of hysteria at the thought of an imminent terrorist attack, I really don’t think it would work on the Brits. For the most part we are a liberal and tolerant lot, and we don’t like to be told what to do. No, I suggest less stick and more carrot. Let’s look at ways to encourage our audiences to view a theatre performance as a period of joyous release from the tyranny of the smartphone, a time when no one (not even our Bunbury friends with their life threatening illnesses) can contact us, and where we can immerse ourselves fully in make-believe. Even if only for a few hours. TIME OUT: Can you tell us a bit about yourselves? Cumberphone: We initially formed as a small group of actors (mostly from musical theatre and mostly in our thirties), who met at a social event over the summer and got talking about the issue of mobile phones at weddings – having them on silent whilst still using them as cameras. Also around our table was a writer who was working on a play about the discovery of radio waves and the birth of wireless communication, and an actor who routinely carried a mobile on stage with him, to jokingly answer if one went off in the audience. And so the notion of setting up a campaign-of-sorts was born. TIME OUT: So your campaign is named after Benedict Cumberbatch, and it was specifically inspired by a speech he made asking people not to record performances of Hamlet on their phones – was that a sort of road-to-Damascus moment for you, or had you already been toying with the idea of doing something? Cumberphone: We were already pretty set on trying to do something fun within the industry – encouraging more pre-show short films from casts, with lyrics to songs changed to be about mobile phones, or whole skits like the brilliant one the Avenue Q team in the U.S. have subsequently released. So when the media reaction to Benedict’s little stage door soliloquy was so huge, we felt compelled to launch a more fulsome public campaign – it felt like a touchpaper had been lit and the moment was right. When the Society of London Theatres released a statement saying they hadn’t heard of any initiatives beyond pre-show announcements, and when the Barbican’s reaction was to attempt to go into prison-camp-style lock-down (something that might well work for this one show, but was unlikely to have any lasting industry-wide impact), we felt that a broader discussion was needed – but we don’t seek to lead that discussion, just to better help facilitate it and focus it on practical solutions. We welcome input from all quarters, and want to bring together a broad spectrum, from shushers to shruggers, from texters to tutters. 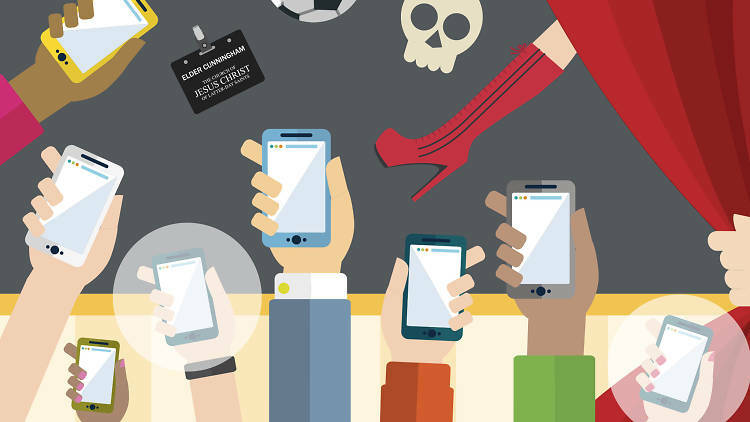 TIME OUT: Do you think theatre behaviour had got worse in the mobile phone era? Cumberphone: Theatres seem somewhat stuck in the era of first generation mobiles and pagers that might accidentally go off, and seeking to avoid it with polite reminders, as opposed to the entirely different new reality of Smart Phones, which are interwoven into the fabric of our identity and personhood and are almost never turned off in daily life. Even diligent theatergoers often struggle with just how resilient their phones can be to pacification – for instance, many people incorrectly assume silent or Airplane mode are sufficient. 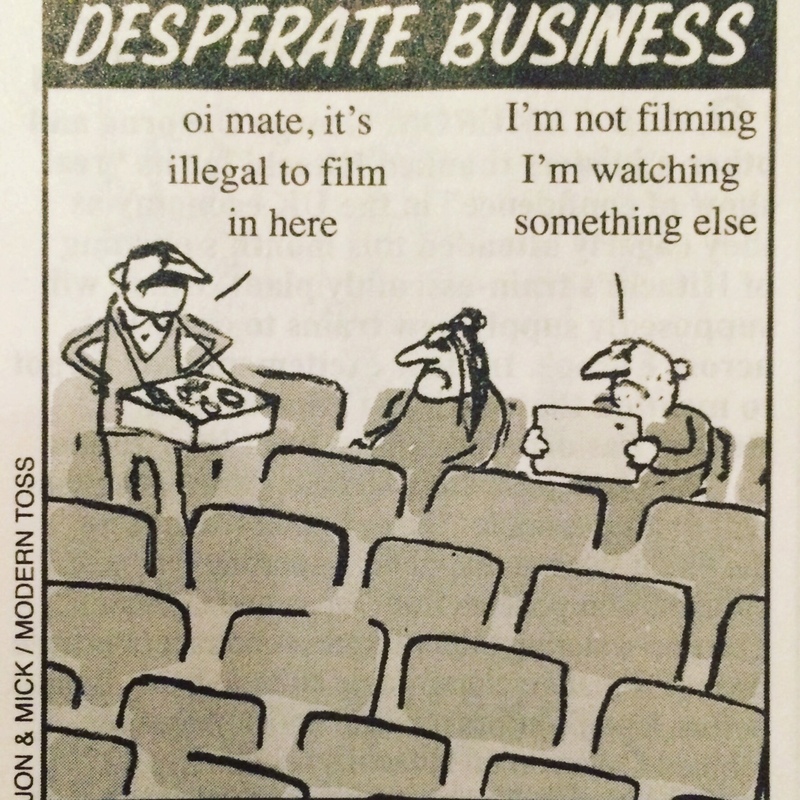 If people are taking photos or filming, it may be seen as disruptive or disrespectful to some in the Theatre, but it’s also entirely normal in almost every other aspect of daily life, and it usually means you’re enjoying a moment rather than trying to breach copyright. We can’t properly address the issue until we better understand it. Much of the disruption isn’t necessarily a phone making noise, or people taking photos, but rather the constant checking – a lit-up ‘ghost-face’ is distracting up on stage as well as to fellow audience members. It’s not a case for making theatre more compelling – people these days could be watching humanity set foot on Mars, whilst still thinking nothing of multi-tasking to tweet about it, or check up on the babysitter. So this is more about Theatre playing catch-up. And no, we’re not advocating for “tweet seats”, but we do want to see more digital content, better WiFi, more e-ticketing and the like. We love our phones – and if theatres want us to turn them off they’ve got do a better job than just a brief announcement moments before curtain-up. Signal-jamming and frisking and compulsory lockers and the like is out, not least because theatres actually want us to use our mobiles more – whether that be ordering interval drinks, or downloading digital programmes, or tweeting about the show. For us this isn’t about being more draconian, it’s about being more innovative. TIME OUT: What do you think can really be done about it, beyond the phone announcements most theatre shows make at the start already? Do you think you can alter people’s behaviour? Cumberphone: There are some simple psychological nudges that can be deployed, such as having no-phone logos on the front of tickets instead of small print on the back, and relatively cheap modifications such as providing seat-back pockets for people to put their phones in and hooks for jackets and handbags, and exit signs could incorporate clocks. Theatre should seek out advice from other ‘nudge’ campaigns such as the anti-smoking Stoptober – there’s far more we could be doing. Then there’s the technological infrastructure aspect – directly communicating with the audience via their mobiles. Booking systems should require or incentivize us to provide mobile phone details, just as we do with emails (and as is commonplace for train tickets). As well as sending a brief reminder text-message containing seat locations, venue address and show running time, it could also include a link to a funny short video filmed by the cast asking you to turn off your phone – which is likely to have more impact than a faceless PA announcer alone. Existing confirmation emails are fine up to a point (if somewhat varied across the industry), but they contain a plethora of information – we need just the basics, and for “no-phones” to be included in that, not just buried in small print as an after-thought. We want to see the industry do more to share best practice, and we should find a point-person to co-ordinate this. A wider publicity campaign (with plenty of scope for commercial sponsorship of short films and adverts) fronted by theatre’s leading lights could help better sell theatre as the special one-off live event that it is, an almost unique place where you can uncouple from your phone for a few of blissful hours – rather than being frowned upon for “not knowing the rules”. Secret Cinema currently do this very well with their no-phones policy and #TellNoOne tagline, and the star-studded “Don’t Text or Talk” pre-screening short films at the Alamo Drafthouse cinemas in the U.S. go way beyond our old Orange “Don’t Let a Phone Ruin Your Movie” ads. We can do more – and it can be fun, something that far from excluding or berating audiences can actually help better get them in the mood for the show ahead. Having cast members perform a skit, or make a direct appeal, is bound to have more of an impact than a FOH manager or PA announcement – as is involving audiences in verifiably turning off their phones together as part of a collective ritual, rather than just hoping everyone has already and all that’s required is a brief reminder. And given that even if you turn your phone off it can turn back on with the gentlest of accidental flicks, we also want Theatre to lobby the mobile phone industry to incorporate a stealth-mode function that’s as simple to turn on as Airplane mode with just a single swipe. Effectively a way to ensure your multi-faceted super-smart phone remains truly silent, motionless, dark and non-invasive (even if it turns itself back on) but can still function if you need it to – such as using it as a camera at a wedding. Part of the problem theatres face is that phones (which the smarter they get can take so long to turn off and back on again) are so integral to who we are, that turning them off entirely can feel like losing one of your senses – most people just don’t do it in any other area of their daily lives, not even when we’re asleep. We can even use our phones on airplanes and underground trains now. TIME OUT: You’ve explicitly decided to go down a sort of ‘fun’, ‘friendly’ route to your campaign, differentiating yourselves from Theatre Charter. Can you just say a bit more about that strategy and your awards and stuff like that? Cumberphone: Our campaign is focused entirely on the single issue of mobile phones, and we seek to work to find creative and innovative solutions. We totally appreciate where the Theatre Charter is coming from, yet we equally understand why many people find the very notion of ‘etiquette’ off-putting and exclusionary. Audiences in the West End are mostly going to be different from those in a community or pub theatre – there’s no panacea, no one-size-fits-all approach. Having fun videos like that produced by Avenue Q is very much the route we’ve decided to take. We also have “The Cumbies” awards for best practice – whether that be a creative company tweet, a funny show-stopping technique from a cast member, or Cumberboo awards for bad behaviour – and we’ve named many of them after people who’ve famously spoken out, such as Richard Griffiths, Patti LuPone and Hugh Jackman. It’s all just part of helping to get people talking. Securing theatre funding, discovering fresh talent, bringing in new audiences, increasing diversity and opportunity across the industry – all of these are of course greater priorities. But mobile phones are increasingly becoming a bit of an issue too, so we’re just here to help play our small part – hopefully the ideas presented in our “mobiles manifesto” will lead to some lasting solutions. Are mobile phones ruining our theatres? Two grassroots campaigns are aiming to tackle the ‘crisis’ of mobile phones in theatre – but is there one? Richard Gresham is mad as hell… and he’s not going to take it any more. The 52-year-old – who sells theatre advertising – has secured some notoriety as the mastermind behind Theatre Charter, a voluntary code of theatre etiquette that’s caused ripples for its stringency – one ‘pledge’ is to pre-unwrap your sweets before sitting down – and its suggestion that London audiences have gone to the dogs. What he wants, he says, is a debate on the subject with bigwigs in Theatreland, including the influential Society of London Theatre (SOLT), to see what can be done – for instance, making a pre-show announcement to turn phones off compulsory. But despite his campaign having its supporters – an encouraging Tweet from Stephen Fry brought it to wider attention – the industry has cold-shouldered him: ‘if they tell me there’s nothing that can be done and that I should go away, I will’, he sighs. ‘I just don’t understand why they won’t speak to me’. Should tolerance have its limits, though? 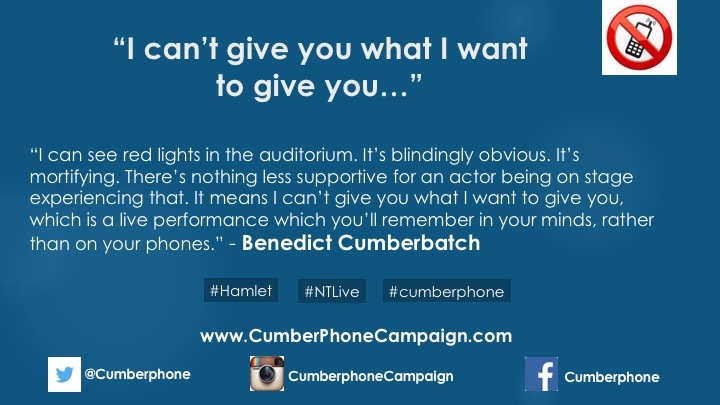 In August, Benedict Cumberbatch made an impassioned plea after a performance of ‘Hamlet’, asking his adoring fans to use their mobile phones to film him… begging them to stop filming him on their phones during performances. The message duly went viral, spawning a second grassroots anti mobile phone campaign. They’re a bit wary of Theatre Charter – ‘we understand why many people find the very notion of ”etiquette” off-putting and exclusionary,’ says a spokesperson – but have come to broadly the same conclusions: that theatres ‘seem stuck in the first era of mobile phones’, unable to deal with the constant, low-level intrusion of push notifications. Cumberphone’s solution [*] is to promote the sharing and creation of humorous anti-phone messages to ‘nudge’ audiences and theatres into ‘best practice’. [*] Plus plenty more besides! See our Manifesto highlights here. I hit a brick wall of bland press statements when I attempted to press the industry: Julian Bird, chief executive of SOLT said: ‘Society of London Theatre believes that those attending a live performance should be considerate to their fellow audience members and performers as electronic devices can cause unnecessary distraction and disruption.’ No kidding. And a spokesperson for ‘Hamlet’ merely said ‘the company… have nothing further to add on this matter.’ Cheers guys! Are we living through a crisis? It does seem that every advance in mobile phone technology ushers in a new world of potential dickishness. But it’s not my experience that theatre is being ruined. As with anything in life, try not to be a douche when you go to the theatre – and be aware that the person sitting next to you may well be plotting an elaborate campaign to switch off your phone. 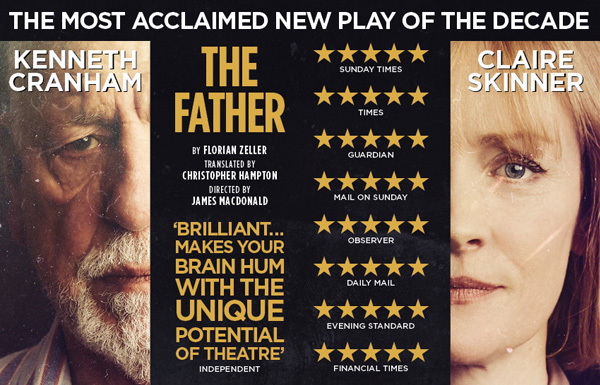 Listen to this 2-minute audio clip of Kenneth Cranham and Claire Skinner, currently starring in Christopher Hampton’s The Father at the Wyndham’s Theatre, on Graham Norton’s BBC Radio 2 show on Saturday. Here are a list of interesting articles on some of the more draconian (“Big Brother” in some cases) measures that might be deployed against mobile phones – and some very useful insights into how and why they are mostly unsuitable for Theatre – whether from a technological, societal, cultural or political standpoint. We’ll explore these further in our Manifesto and elsewhere on our website in due course. Geo-fencing is notoriously unreliable – the leakage of any signal-jamming affecting nearby pavements, restaurants and businesses up and down Shaftesbury Avenue would be a nightmare, and geo-fencing has often been shown to fail to ‘release’ your phone signal once you leave its range. Signal-jamming is basically mostly illegal. Those who work in Theatres, not least the actors stuck in their dressing rooms for long periods before shows, often out on tour far away from home, yet increasingly expected to be co-opted as online daily marketers of their show, would if anything be in favour of better WiFi rather than geo-fenced signal-jamming. Remotely disabling phone-cameras and other software may appeal to tin-pot dictatorships, but certainly isn’t going to fly here – and what of emergencies, or even permitted/encouraged photo-opportunities inside theatre buildings? New York City banned mobile phone use in Theatres (and museums, libraries, etc) in 2003, including a $50 fine, but it has had a negligible impact. The UK Government has all but given up on trying to prevent mobile phones getting into prisons, so there’s no sense trying to replicate that failed strategy in free and open buildings (even if this Orange cinema ad is undoubtedly funny and quite appealing) – although there’s certainly scope for better facilities such as phone-charging-lockers at Theatres. Theatres are (rightly, in our view) increasingly encouraging audiences to use our phones – whether that be to purchase our interval drinks (e.g. via ATG Ordertorium and Barbican Bars), enjoy more digital content (e.g. NT Backstage), use e-tickets (e.g. TodayTix), pay for things using Contactless (e.g. ApplePay), Tweet about shows, etc. If anything, we need better WiFi in Theatres (perhaps call the networks “Curtain Up? Phone Down!”). So even if anyone wanted it to happen (in our opinion it shouldn’t, but we sympathise with those who do), it ain’t going to – so we’d prefer to focus on other more positive steps we can take to better enhance the experience for the mobile phone user, which we believe might actually be more likely to reduce mobile phone use during shows themselves. Avenue Q release fab #Cumberphone video! Who’s next? What a way to kick off “Off-tober”! 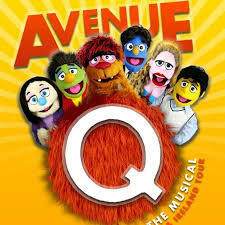 This is brilliant stuff from AvenueQ – hopefully it will spark loads more! We’d like all of you wonderful theatricals reading this to perform a line, portion, scene or song from your show (or a rival show perhaps) – with words suitably adjusted for the phone-addicted audience – post it online – on Twitter or Instagram or Facebook or Vimeo using #cumberphone – then nominate your fellow professionals to do the same. It’ll be hard to beat that Avenue Q video – but give it your best shot! It’s like the ice-bucket challenge, crossed with #15secondshakespeare – but less cold! Indeed we do. And so here it is. 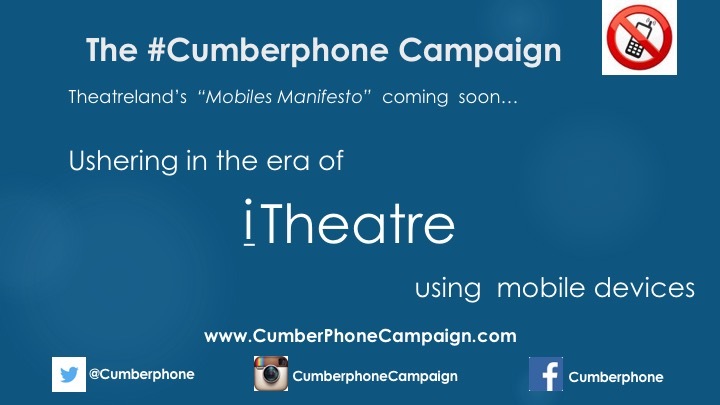 Our Theatreland Mobiles Manifesto will be launching in October – this is just our opening salvo in the campaign – so hopefully we’ll have lots of your comic/tragic #cumberphone videos in before then to help kick things off with a smile. 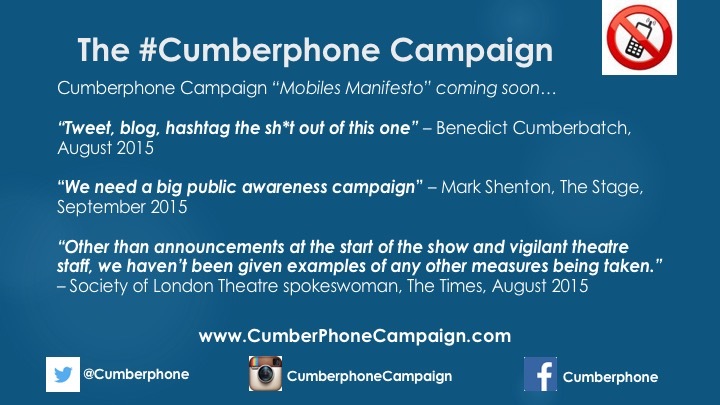 The #Cumberphone Campaign Awards – “The Cumbies” will be annual, but (given just how prevalent those mobile phone intrusions are) there will plenty of chances to earn an Honourable Monthly Mention in some categories. Best pre-show short film (comedy, musical and drama categories) – self-nominations open now! Brief Announcements and Signs don’t seem to be doing the trick so far, do they? The idea of having short, humorous, educational and irreverent films and performances before all shows is a key plank of the Cumberphone Campaign – so if you’re in a show or part of a company and want to make a short video… please get uploading now! We hope that Theatreland will institute far more ritualised and collective acts of encouragement to audiences to “turn their phones off” (although it’s not that simple – see Stealth Phone and the Mobiles Manifesto) – and a great deal of that is going to be in the hands of our talented, tireless actors. It should be fun, not onerous, for both audience and performer. If all those wonderful performers are willing to strip naked for the good cause that is West End Bares, then surely we can pull this off too. We hope you’ll consider get on board with the campaign too! The group is set to launch a “Theatreland Manifesto for Mobiles” in October, which it claims is full of innovative and bold new proposals, and hopes to win the backing of key industry bodies the Society of London Theatres, ATG, Delfont Mackintosh, Equity and others, during an open consultation process – during a period it has dubbed Off-tober and Nophone-vember. The alliance of performers and theatre-lovers – which says it is “not an organisation, but rather an idea” – is also hoping to emulate the success of the recent online craze #15scondshakespeare, where famous names performed snippets of pop-song lyrics in overly-dramatic style. It’s also encouraging theatre-loving members of the public to do the same. 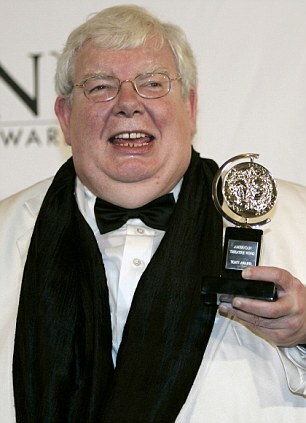 It will host an awards ceremony – “The Cumbies” – to celebrate the best of them, as well as to hand out an array of gongs, such as the Richard Griffiths Memorial Show-Stoppers Award, the Bianca Jagger Audience Vigilante Award and the Patti Lupone Annual Achievement Award – as well as Cumberboo Awards for poor behaviour across the industry. Patti LuPone has hit the headlines in the US yet again, having already snatched an audience member’s phone on Broadway earlier this summer, after she spoke out against a recent series of adverts by US phone-giant AT&T that depict people watching sports on their phones during live theatre performances. “If we don’t act now, then when will we ever?” he said. Saying it wanted to help bridge the growing divide between the tutters and the texters, the shusshers and the shruggers, the new Campaign praised the efforts of last summer’s Theatre Charter to promote better audience behaviour – from not talking, rustling sweet wrappers, using mobiles or arriving late for a show. But, pledging that the Cumberphone group would run an entirely positive campaign, Fletcher stressed: “This isn’t just about etiquette, this is about finding and implementing creative and credible solutions. “We’re not a band of Luddite Luvvies – quite the opposite. We love our phones. You’ll not find a more phone-addicted, tweet-happy bunch than actors out on tour. “You can use your phones on the London Underground now, and there’s WiFi on airplanes – so it’s hardly surprising that theatre-goers are struggling to adapt to theatre’s status as one of the last few remaining refuges. The group praised the emergence of new theatre apps like NT Backstage, ATG Ordertorium and TodayTix; it wants to see better WiFi in theatres, an expansion of e-ticketing and contactless payments – and is also calling for direct engagement with audience members via their mobiles. “You’re probably more likely to turn your phone off if you’re texted some time before a show with a link to a video of its leading stars asking you to, rather than blared at by a faceless PA system moments before curtains-up,” continued Fletcher. “There are also a number of simple psychological ‘nudges’ that could easily be deployed – such as putting a bold ‘no-phones’ logo on the front of tickets rather than dense small-print on the back. “But this is obviously about far more than clearer signage or better announcements. Reminding people to turn their phones off is one thing, and we can certainly do that better, but we must change the whole way we go about it – because what we’re doing now certainly isn’t working very well, is it? “This isn’t about being more draconian, it’s about being more innovative. 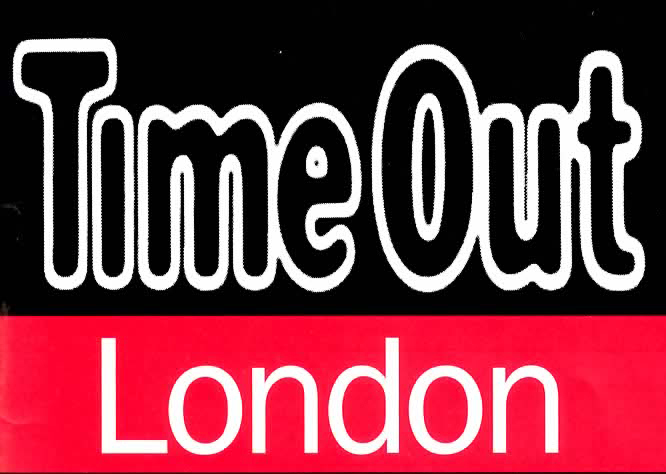 See transcript of our conversation with Time Out here. Benedict Cumberbatch (see video below) is by no means alone in speaking out. West End stars have increasingly been taking to Twitter (and other more private forums) to call for greater efforts to be made by theatres and producers ahead of shows, rather than just by ushers during them. They insist it’s not a question of copyright infringement, or substandard recordings of performances appearing online, though that remains of concern. It’s about the effect it has on the experience for the entire audience – whether that be performers themselves being distracted, or the distraction of fellow audience-members. Carrie Hope Fletcher, Eponine in Les Miserables at the Queen’s Theatre, recently took to Twitter in a series of colourful messages to her almost 400,000 followers to complain that being filmed during a performance had completely put her off. “When it’s a concert it’s sort of become the norm. Theatres are a very different atmosphere. It’s hugely disrespectful to those on stage and those around you,” she said. Avenue Q have set the bar pretty high with this perfect #Cumberphone video, released on 1st Off-tober 2015! 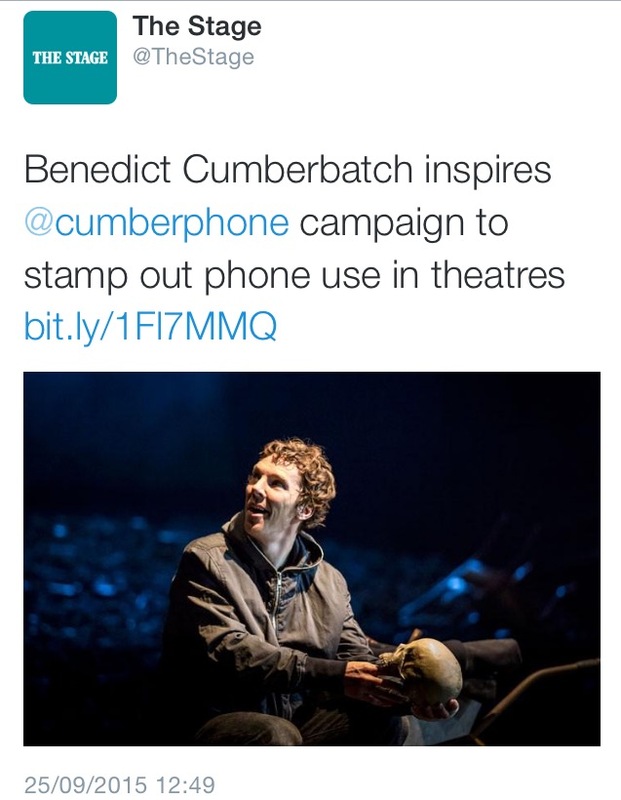 The Cumberphone Campaign has been launched in the U.K, named in honour of Benedict Cumberbatch who made a direct appeal to his fans to stop using their cellphones during his current run of Hamlet at the Barbican Theatre to film and photograph the show. “Neither are we a Cumberbatch fan-site (lovely chap though he is), or a parody – although admittedly our very name and our penchant for prefixing anything that moves with a “cumber” is perhaps grounds for a raised eyebrow. We are currently in Previews. Opening Night isn’t until October. We are emphatically not a bunch of huffy Luddite Luvvies – we love our phones, we really do. (You’re most likely reading this on your phone too, right? Well, so long as you’re not doing it during a show, that’s fine by us). We aim to bring together a broad spectrum of theatre-lovers, from the exasperated angry shushers to the laid-back shoulder-shruggers. We will attempt to flesh out our modest proposals further with the launch of our Manifesto in October. But we’re not attempting to get elected to anything – we’re merely hoping to gain your interest and win your support. The Manifesto will be a living, breathing document, open to all for fresh ideas and input as the campaign progresses. The Cumberphone Campaign has been launched to finally and properly address the vexing issue of mobile phones in theatres. It’s got to be more than simply “turn it off” or “no photos”, with varying pre-show announcements and haphazard brave ushering. We need a unified approach across Theatreland, and we need it now. If we in Theatre can harness our collective imagination and creativity to the fullest (something we should be pretty good at), combined with tech savvy and marketing nous, then we can hopefully have a dramatic impact. 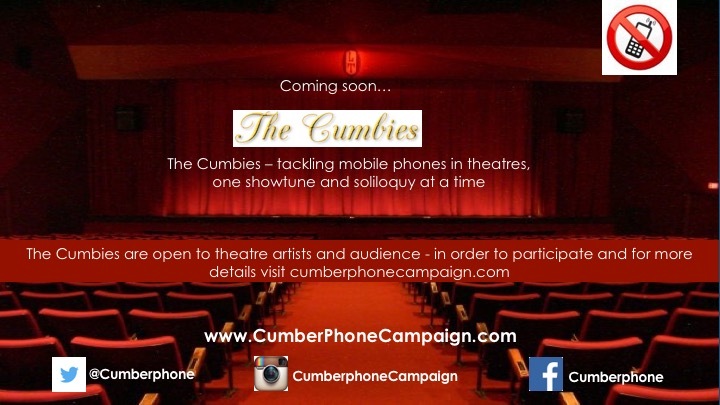 To make your #cumberphone video message for “The Cumbies” Awards, please visit our Awards page: “The Cumbies “– tackling the issue of Mobile Phones in Theatres, one showtune and soliloquy at a time. For inspiration, check out these brilliant pre-screening “Don’t Talk” shorts from the Alamo Drafthouse cinema chain in the U.S. – Hollywood’s finest doing doing their bit for the cause. The Society of London Theatres, Equity and The Stage* et al will hopefully get behind the Cumberphone Campaign soon, and we aim to enlist the crucial support of the likes of ATG, Delfont Mackintosh, Really Useful Group, Nimax, STAR and others. And most importantly, all of you – an alliance of theatre lovers and theatre professionals, from actors and ushers to producers and critics, and the all-important theatre-going audience – we must all come together to find a solution. 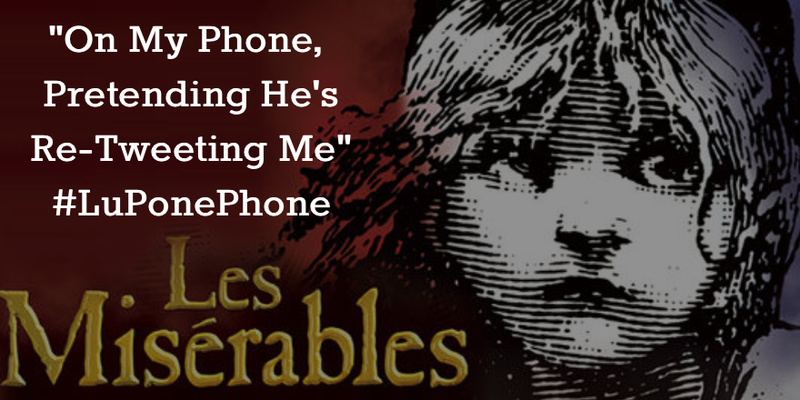 Because we love our phones and we love our theatre – and there’s no reason why we can’t find a way to get them to love each other! To share any comments, suggestions or Ideas, please visit our Supporters page. We do not claim to have all the answers. Neither can we claim to be the only ones asking the questions. We’re just part of the ensemble, here to help enrich the harmony. The excellent Theatre Charter was launched in July 2014 – and its founder has been a tireless and fearless champion of promoting better theatre etiquette. We’d urge all of you to read and sign the Charter if it takes your fancy, and follow them on twitter too – a voracious theatre-goer, an avid theatre-lover and a guardian of sanity and decency at the pioneering vanguard of this struggle. We applaud the Charter’s efforts, and the army of 2,000 who have already signed-up – bravo! The Cumberphone Campaign is somewhat different. Firstly, we’re focusing solely on the issue of mobile phones. Secondly, for us it’s not so much a question of “etiquette” – for many, the very word itself raises hackles (though we of course fully support such a drive to raise standards of behaviour) – but of assisting even the most polite and diligent of theatre-going souls in mastering the art of the phone (e.g. see our Stealth-Phone guide). After all, if even Nicholas Hytner and The Stage’s Mark Shenton and Theatre Charter-backer Terri Paddock’s phones can all go off during a show, then we’re probably facing a struggle against something more than poor etiquette alone. Above all, we want to make it fun, as we are keenly aware that the Stephen Fry-backed Charter attracted some very unjust flak last summer for being “red-trousered”, “passive-agressive”, “theatre police” etc – sadly par-for-the-course whenever us Theatrefolk have the temerity to advocate for Theatre’s special place in our society. We are emphatically not a bunch of “huffy Luddite Luvvies” – we love our phones, we really do. We aim to bring together a broad spectrum of theatre-lovers, from the exasperated angry shushers to the laid-back shoulder-shruggers. So the Cumberphone Campaign is merely here to lend a cheerful helping hand along the trail that has been blazed by our Chartist friends. Think of us, if you like, as Friends of the Earth to their Greenpeace, or as Professor Brian Cox to their Richard Dawkins. Our Mobiles Manifesto concentrates on offering some positive steps (some far-fetched, some surely a no-brainer) that we in Theatreland can take towards better addressing this issue collectively. There’s no panacea, no one solution. But surely, if we all pull together, we can do better? Because at the moment, the phones are winning – but they’re our phones, so let’s show them who’s boss! They’re always going to go off from time to time no matter what we do, but at the moment we’re just making it far too easy for them. We can’t sniff at them over our pince-nez and hope for the best, but neither should we throw our hands up in the air and simply give up. 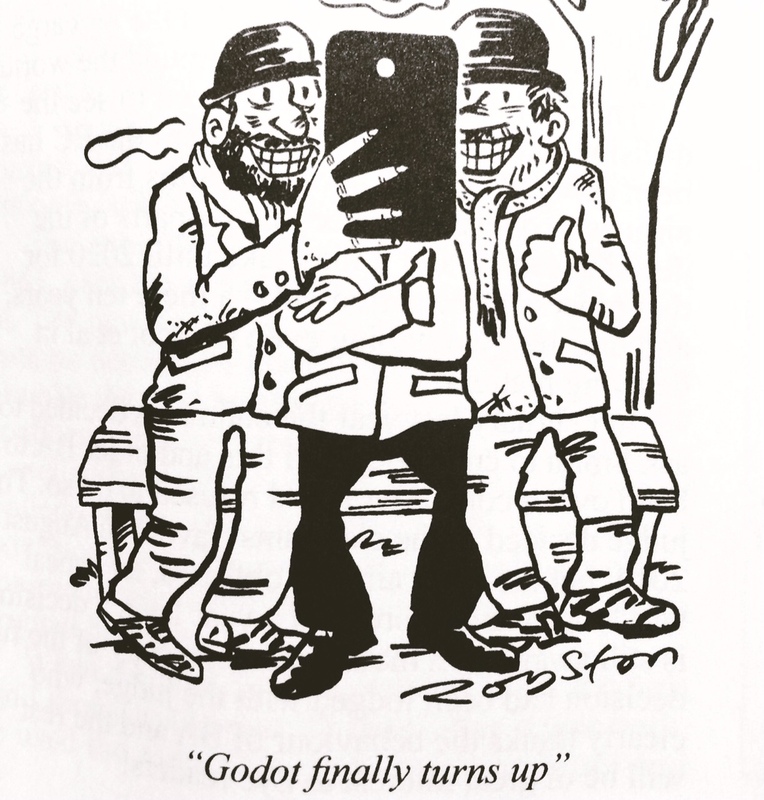 It’s also understandable that so many of us these days (and that number is only going to increase with the newer generation of theatre-goers and the further proliferation and integration of tech into our very personhood) think selfies and filming and mid-show texting is ok – we’re addicted, aren’t we? You can even use your phone on the Tube and on airplanes now. The Theatre is one of the few remaining bastions, or rather refuges – and we should aim to more enticingly sell it as such. We should think of it less as a fortress, and more as a spa – regarded not just as a place where you can’t use your phone as you normally would for the other 21 hours of your small-screen-dominated day, but rather a place where we feel we are relieved and grateful not to be able to do so. It should feel less like entering a prison camp, and more like going to your best friend’s wedding or your grandmother’s funeral – where the concern about your phone intruding upon the event is paramount (well, after the joy/sorrow of the important family occasion, naturally). We’re not anti-phone at all. Far from it – we’re very pro-phone, and so we’d simply like Theatre to catch up a little faster please. We want Theatre to better embrace technology (no, we’re not advocating for “tweet seats” – an “operatically stupid” idea in the eyes of many) – we want better WiFi; we want more e-ticketing and theatre apps (no, we’re not sponsored by TodayTix); we want more digital programmes and content (NT Backstage is great, and they’re finally getting a proper mobile site up soon too); we want more NT Live and Digital Theatre and the like; and we want theatres to interact with the audience through their phones far better than they do now. Great efforts are being made to have us buy our interval drinks through ATG’s Ordertorium app (with accompanying all-seats leaflet drop) and via the likes of the Barbican Bars app. So why not make more of an effort to sell us ideas through our phones, rather than just tickets and drinks and programmes? Perhaps, for instance, we’d be more likely to turn our phones off if we were texted a link to a star-studded funny short film (like these) than blared at over a PA system? Education and a cultural shift will only go so far however. In the West End in particular a huge proportion of the audience are from overseas or out-of-town and often irregular theatre-goers – so no amount of brilliant and ceaseless coverage in the likes of The Stage is going to have much of a direct significant impact on these folk. So our best option is to do a better job of the pre-show routine. But this isn’t just about the announcements a few moments before curtains-up – however funny or pleading or threatening they may be. From the moment you buy your tickets, there are a number of ‘nudges’ that can be deployed to better prepare theatre-goers. We aim to better institutionalise these processes across the industry – and there’s safety in numbers. No one theatre or production wants to be that awkward, prissy, irascible nerd who won’t stop banging on about mobile phones, do they? But some can certainly blaze a trail. Places like the Lyric Hammersmith who do so much work with young people should integrate phone-ed into their outreach, productions like the record-sell-outs that are the Barbican’s Hamlet, the Menier’s Funny Girl or the forthcoming Leicester Curve tour of Pixie Lott in Breakfast at Tiffany’s will be able to reach out to fresh parts of the audience, and we hope they embrace that opportunity. Interactive rowdy musicals like Rocky Horror, or smash hits like Mormon, can grab the audience by the figurative throat. And Hangmen at the Royal Court, well, you can see where we’re going with this. Hampstead and the Almeida, as well as transferring brilliant productions, can also be conduits for innovative phone initiatives too. (Anyone who saw Privacy at the Donmar and who didn’t change their phone’s meta-data-gathering location settings afterwards, raise your hand.) Michael Grandage (with his great pricing initiatives) and Kenneth Branagh (nice trailers by the way) and the new regimes at the National and the Old Vic – let’s see what you’ve got. And as for the exciting new Hytner/Starr theatre – what a golden opportunity to get things right from the outset. Sorry if this all sounds too London-centric – we just thought we should probably start by shooting the fish in that barrel first. But through the likes of ATG and START – and a dedicated band of touring actors – we hope to spread far and wide. The West End may be the epicentre of the Theatre universe, but – just as the Nicene Creed wasn’t born in Bethlehem – we fully expect some brilliant idea or shining beacon of excellence to emerge from the likes of Chichester Festival, Theatre Royal Bath, the Edinburgh Fringe, or perhaps the Sheffield Crucible with its wealth of experience hosting the ultimate of all hear-a-pin-drop events, Snooker. So it’s not just about London, and it’s not solely about “theatre” – those companies and venues who produce dance, recitals, concerts, gigs, stand-ups – there’s plenty to be learnt and shared across the board and we welcome ideas from all quarters. Theatre can draw on the most creative, funny and inspiring bunch. Phones are a bit of an issue, aren’t they, and not just at the theatre, so let’s see if we can do something about it then shall we? If not us, then who? If not now, then when? As for the pre-show announcements – be they films, safety curtain projections, a polite FOH manager or an hilarious cast member – they need, in our view, to be more substantial. They should not be brief reminders or stern threats – they should be an integral part of the theatre-going experience. We need to consider the notion of having them more akin to the old Curtain-Raisers. And not to the detriment of, or distraction from, the main event either – but something positive that can serve to warm up the audience and bring us all together (that band playing before One Man, Two Guvnors being a superb example of how to get everyone properly in the mood). More like a 5-star gourmet amuse-bouche served ‘compliments of the chef’ than a basket of stale bread just plonked down on the table by an underpaid tip-less waiter as they monotonously read from the ‘specials’ board. That’s not to say, of course, that one size fits all – whether that be technological or theatrical. What works in the Arcola or at The Park isn’t necessarily going to fly in Drury Lane or the Apollo. We get that. It’s our sincere hope that this campaign can play its small part in bringing us all together to discuss these issues and explore these ideas perhaps a little better and more substantially than we’ve managed to thus far. And crucially, in discussing them, to focus on how to actually implement them and establish industry-wide best practice. We’ll give it a go anyway. And we hope that you’ll be willing to be part of that conversation with us. At times some of our rhetoric may seem a little too strident or florid for some people’s tastes – but, hey, it’s a campaign after all, and we want it to be fun (dramatic, even, although we’ll try our hardest not too flounce too much), so we hope you’ll forgive us our foibles. Along the way we’ll do our utmost to always respect the fact that theatres and those running them have a ridiculous amount on their plates – not least the most basic concerns over funding to ensure survival, and the monumental effort it takes just to put on a show – without us adding to their worries. We don’t wish to be a thorn in anyone’s side – but instead a blooming rose. And for those wonderful performers we hope to enlist along the way, we appreciate there are a plethora of other good-causes more worthy of your attention, to say nothing of lines to learn, marks to find and digs to locate. Most of all we’ll always aim to improve and to be inclusive – all ideas welcome, all contributions valued. Lastly, we’d like to point out that we have no official connection to, or endorsement (yet!) from, Benedict Cumberbatch – beyond his sterling and unfailingly polite call to arms (to “Tweet, blog, hashtag the sh*t out of this one”) – we just felt that #cumberphone seemed a fitting and fun epithet with which to kick it all off. Neither do we have any official connection to any theatre company, production company, publication or organisation. We are merely a small but growing rag-tag band of theatre professionals and theatre-lovers who wish to remain anonymous – we wouldn’t want anyone to be reprimanded or sacked for playing a full-throated part in this campaign, now would we? Or, for that matter, for any disagreements or divergence of opinion about this particular issue to have an impact on our professional or personal relationships with one another. In any case, it doesn’t really matter who we are personally, for we are all of us – we are you (unless you’re reading this during a show!). As some of us depart the fray – perhaps to go away on tour, trapped in the bowels of a regional theatre dressing room, out of reach of decent WiFi – others will step in to take our place, like a rolling wave of advancing, young, petrified Russian soldiers picking up the rifles of their fallen comrades. So you can do whatever, and you’re in the Treehouse – there’s no secret knock. You can follow us on Twitter, add a twibbon to your profile, become a Show Ambassador, recruit your friends and colleagues, (recruit your triple-threat enemies too), make a Video or Vine, post a #cumberphone pic on Instagram – and most importantly help spread the word. Like the janitor at NASA who told JFK that his job was to help put a man on the Moon, every little helps. If you’d like to follow us on Twitter than we can exchange DMs, but we hope you’ll understand if (for the most part) we’re not able to engage in much frenetic and detailed to-ing-and-fro-ing in reply to open public tweets – that’ll just drive all our other followers potty – although we’ll happily wear out our “favourite” button in response to anything you might have to say. So please feel free to email or DM – but the best place for open discussion is via the Comments section at the bottom of the Supporters page. Thanks. We hope you’ll be willing to read our Theatreland Mobiles Manifesto too, once it’s released. We look forward to hearing from and working with you all to help realise our vision. Thanks so much for your time and your interest. 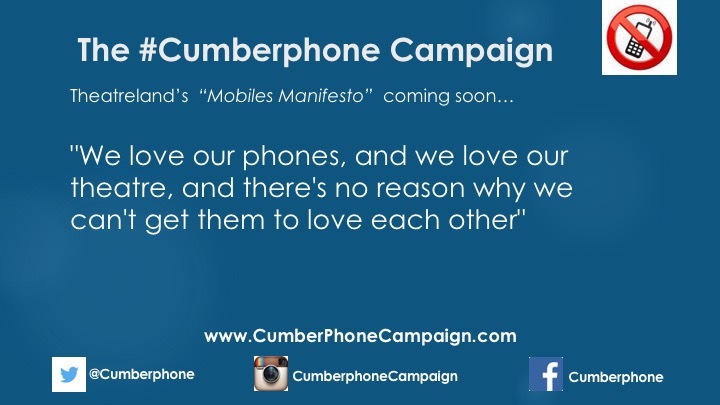 The Cumberphone Campaign is not an organisation – it is an idea. Best pre-show short film Award – make your #cumberphone video message now! 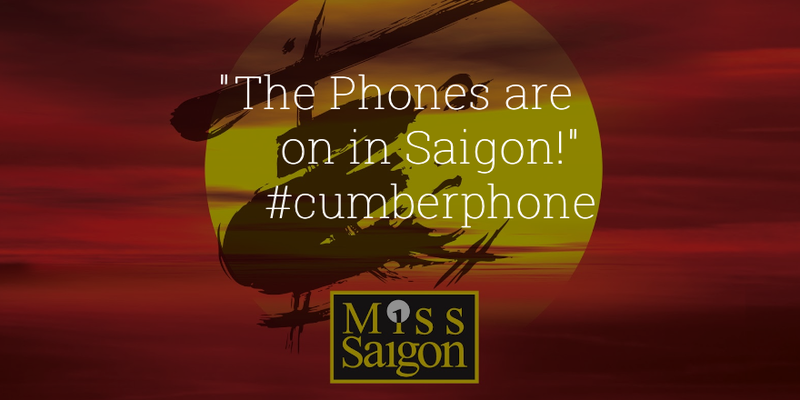 We’d like to get the ball rolling now by enlisting all of you wonderful theatricals reading this to perform a line, scene or song from your show (or a rival show perhaps) – with words suitably adjusted for the phone-addicted audience – post it online – on Twitter or Instagram or Facebook using #cumberphone – then nominate your fellow professionals to do the same. Avenue Q released this perfect #Cumberphone video on 1st Off-tober 2015! These are just the kind of videos we’d like to see all shows make and send out via email and text to audiences ahead of attending a show, to help encourage them not to use their phones during the performance – because brief (often faceless) pre-curtain announcements don’t seem to be doing the trick at the moment, do they? For further inspiration, check out these brilliant pre-screening shorts from the Alamo Drafthouse cinema chain in the U.S. – Hollywood’s finest doing doing their bit for the cause. We think the Michael Madsen Reservoir Dogs one is a peach! If all those wonderful performers are willing to strip naked for the good cause that is West End Bares, then surely we can pull this off too. It’s like the ice-bucket challenge, crossed with #15secondshakespeare – but less cold! It won’t involve any onerous duties, just being a point-of-contact, our go-to-guy, our secret sleeper-agent, for when new things happen in the campaign. So come join our Ambassadors Reception… Let’s see if we can make it fun! 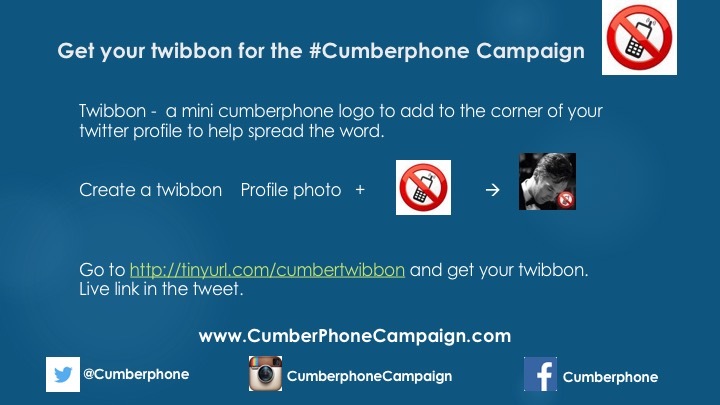 Twitter: @cumberphone #cumberphone – tweet, DM or email us if you’d like to help make this happen. We want anyone and everyone to get involved in whatever way they can. Be you a part-time usher, or a full-time Dame, from the back row of the Upper Circle to the back row of the ensemble, it’s come one come all, and all shoulders to the wheel here at the Cumberphone Campaign. You can do whatever, and you’re in the Treehouse – there’s no secret knock. You can follow us on Twitter, add a twibbon to your profile, become a Show Ambassador, recruit your friends and colleagues, (recruit your triple-threat enemies too), make a Video or Vine, and most importantly help spread the word. 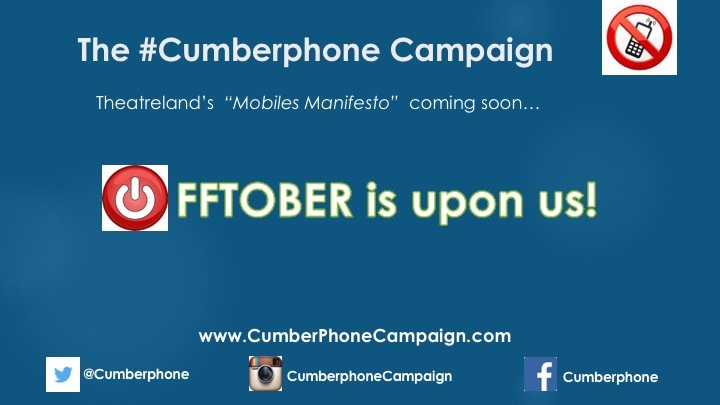 We are delighted to announce the launch of the 2015 inaugural Cumberphone Campaign Annual Awards – “The Cumbies” – get your entry in today – self-nominations are now open! Full awards categories below. 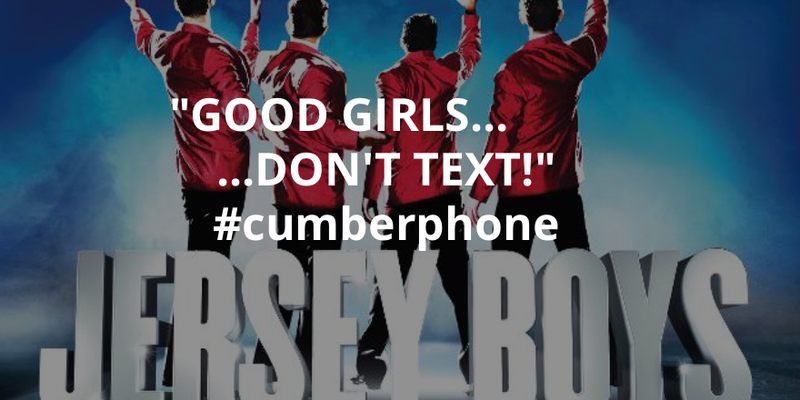 We’d like to get the ball rolling now by enlisting all of you wonderful theatricals reading this to perform a line, portion, scene or song from your show (or a rival show perhaps) – with words suitably adjusted for the phone-addicted audience – post it online – on Twitter or Instagram or Facebook using #cumberphone – then nominate your fellow professionals to do the same. But don’t let AvenueQ’s epic brilliance put you off – we’re just after some small ones for now to get the ball rolling. They can be rough and ready, in costume or not, they can be mere 10 second Vines or Snapchat rants, or they can be a 3 minute Kenneth Branagh Disney extravaganza. They can just be you on your own, a few of you in the dressing room, or the entire cast on stage during warm-up – whatever takes your fancy. There’s no limit on the number of entries per performer or show, so keep ’em coming – we just want to help get people talking. We also welcome entries from the general public and theatre-lovers everywhere. 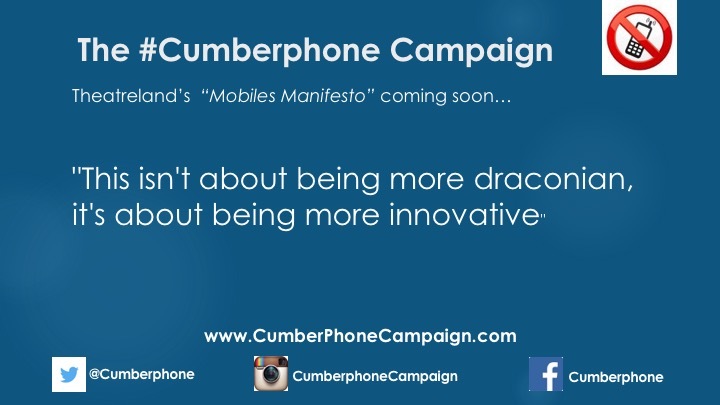 Our Theatreland Mobiles Manifesto will be launching later in October – so hopefully we’ll have lots of your comic/tragic #cumberphone videos in before then to help kick things off with a smile. The idea of having short, humorous, educational and irreverent films and performances before all shows is a key plank of the Cumberphone Campaign – so if you’re in a show or part of a company and want to make a short video, please get uploading today! Statuettes – tbc – open competition for the best design, so come on Props, what’ve you got? Venue – tbc – possibly outside the Barbican Stage Door, weather permitting. Failing that, I’m sure Cameron will be delighted to accommodate us somewhere plush. Sponsors – tbc – TodayTix seem quite a lively marketing bunch though, don’t they? Perhaps EE would like to follow in the footsteps of those Orange ‘no-phones’ cinema ads (Kevin Bacon in doublet & hose, “To EE, or not EE”)? Perhaps the silence-obsessed Dyson or Toyota Auris Hybrid might like a bit of stardust sprinkled on them? You can read more info on the Cumberphone Campaign here. Please let us know (via @cumberphone or on our Supporters page) of any other categories you feel are worthy of inclusion or if you’d be willing to become one of our Cumberphone Show Ambassadors. We are emphatically not a bunch of “huffy Luddite Luvvies” – we love our phones, we really do. (You’re most likely reading this on your phone too, right? Well, so long as you’re not doing it during a show, that’s fine by us). We aim to bring together a broad spectrum of theatre-lovers, from the exasperated angry shushers to the laid-back shoulder-shruggers.